I love roasting pretty much any vegetable, especially sweet potatoes. It’s so easy to make roasted sweet potatoes because all you need is a pan, a couple basic seasonings, and 30 minutes of your time. Roasted sweet potatoes — or anything for that matter — have got to be the tastiest things. I’m a potato lover so anything potato-y makes me extremely happy. But so do super simple recipes that involve 1 pan and hardly anything more than a pinch of sea salt. Sweet potatoes are a fantastic staple to have hanging around in your kitchen. They can be mashed, whipped, used in baked goods, as “toast”, or roasted. They make a fantastic side dish and pair beautifully with some good ol’ eggs in the morning. These roasted sweet potatoes are also delicious in my Sweet Potato & Cranberry Kale Salad. You must try it! 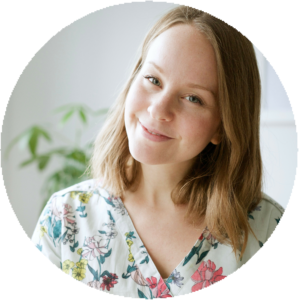 Fibre: fibre helps reduce LDL cholesterol, balance our blood sugar by slowing down the release of glucose into our bloodstream, improves satiety, and supports digestion. Be sure to leave the skin on potatoes for that wonderful fibre content! Beta-carotene: that orange antioxidant pigment we see in carrots, known as beta-carotene, is also abundant in sweet potatoes! Our body converts beta-carotene into Vitamin A, a lovely fat-soluble vitamin that benefits vision, reduces inflammation, supports immune system and fights cellular damage. Eat your sweet potatoes with a drizzle of olive oil or another type of fat to enhance the absorption of beta carotene. Rich in minerals: calcium, iron, selenium and magnesium are a few minerals found in sweet potatoes. Magnesium is essential for cardiovascular support. It’s so easy to roast sweet potatoes. 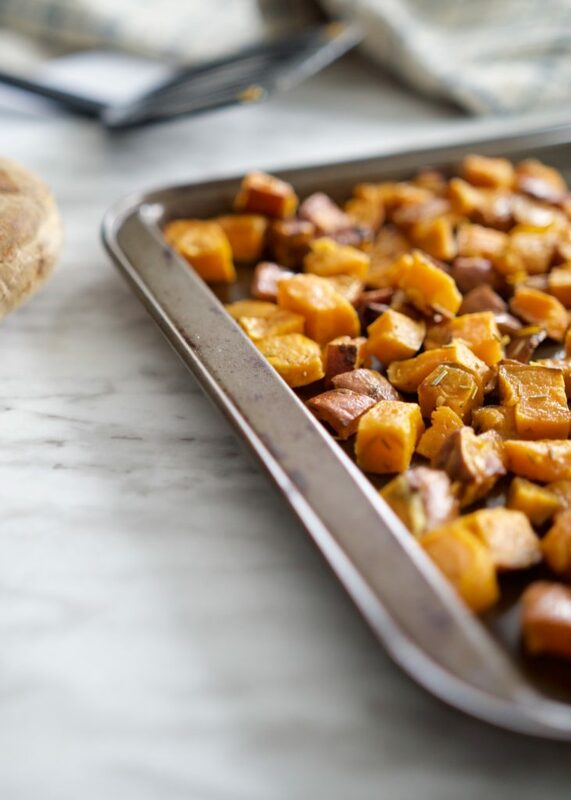 All you need is some sweet potato, some sea salt & pepper, olive oil and any spices of choice. I personally love this recipe with dried rosemary, but you can use absolutely any mixture of spices that you’d like. Roasted sweet potato is one of my favourite things to meal prep. It’s simple to do and is versatile enough to store in your fridge for tossing into salads or frying up with eggs. You can dice them any size you like. Double or triple this recipe for extra servings. 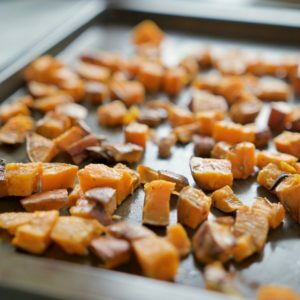 A simple sweet potato recipe loaded with flavour, nutrition and versatility for easy, yummy meals. Dice up sweet potato into bite-sized chunks. Peeling is optional but not necessary. 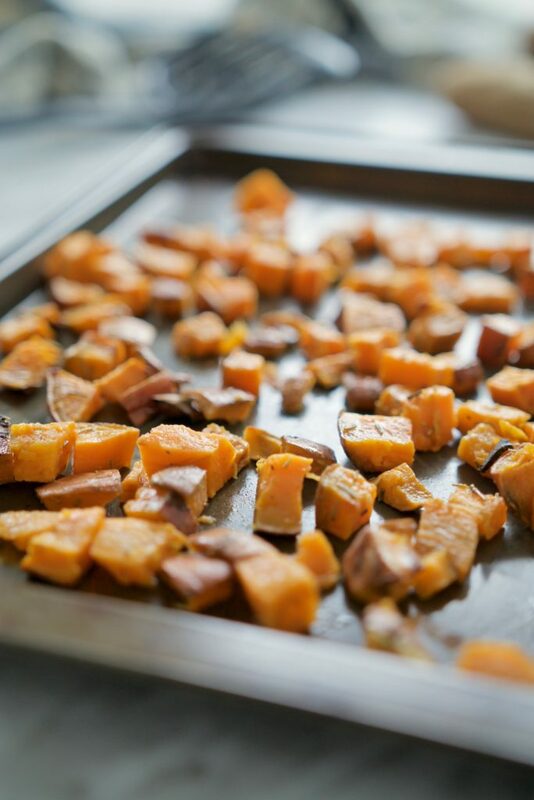 Add sweet potato to baking sheet, drizzle with oil and seasonings and toss until evenly coated. Roast in oven for about 30 minutes until golden brown and lightly crispy, tossing halfway in between. Double or triple this recipe for extra servings. Are you a potato fan? How do you like to eat your sweet potato?